This paper aims to explore female oppressors in three novels by Frances Burney, Maria Edgeworth and Jane Austen, who have been traditionally related and studied by gender studies as paramount in the development of British fiction by women. After defining the concept and the main features of this category, we will explore female oppressors as they evolve from Miss Margland in Burney’s Camilla to Mrs. Norris in Austen’s Mansfield Park by focusing on how they are perceived by other characters, the female ideal they represent, their views of woman’s education and society and their relationship with the protagonists. Two hundred years after the death of Jane Austen, not only have her works not lost their relevance, but they are becoming more and more well-known. However, the large number of existing film adaptations and other audiovisual versions may have the consequence that many people have got to know these stories without having read the books. These versions could also promote a superficial reading of the novels, in which their literary value is not appreciated. 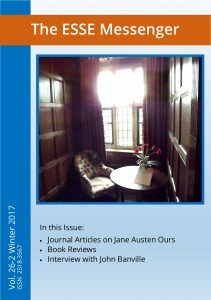 In this article, some keys are proposed to understand and to appreciate the literary style of Jane Austen. In this article, the author explores Jane Austen’s popularity in Spain from a historical perspective. She believes that Austen’s success since 1919, when the first translation of one of her novels was published, is directly related to the socio-cultural and political circumstances of the Spanish literary market, which made her narratives be appreciated by editors, critics and readers alike. Three periods are studied, in particular – the First Francoism (1939-1959), the 1996-2003 period, and the bicentenaries’ period (2011-2017)–, linking them by means of two thematic foci: the irregular explosions of the literary market, and the readers’ longing for escapism and belonging. In marking 200 years since Jane Austen died, this paper comes as a personal testimony of how the author as a reader became more familiar with the person behind the name. Furthermore, it is the somewhat hidden, somewhat obvious intention of this paper to awake in Austen fans a desire to visit the place she lived in while writing her masterpieces and also the last place to have had her mark while she was alive and healthy. The effect will be inevitably the same as always; Jane Austen will become just Jane, the author’s friend that he met once but cannot remember having shaken her hand, yet still she is familiar. This article asks why people are obsessed with Jane Austen’s stories and why her stories are spreading across the globe, across media forms, and across generations? In an attempt to analyse the Austenmania-phenomenon, this article examines various re-presentations of Austen’s Sense and Sensibility in order to discuss what these re-presentations contribute with to the understanding of the source text and to the text universe as a whole. The analysis shows that the re-presentations not only expand Austen’s story and provide insight into the characters and their actions, but also draw attention to historical and contemporary power hierarchies and gender roles.